In this activity, we will be working with a circuit that contains multiple sources. 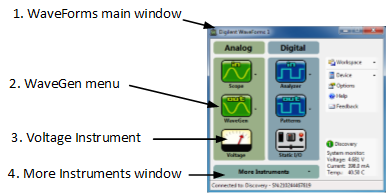 In order to provide the necessary voltage to these sources, we will need to utilize the Analog Discovery's™ Arbitrary Waveform Generator (AWG—denoted as the W1 and W2 connectors on the Analog Discovery). 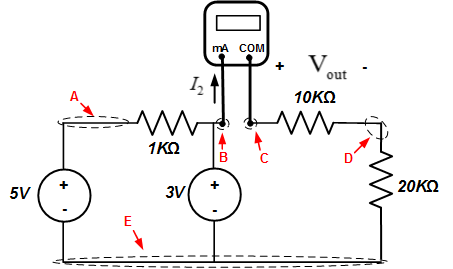 We will explain how to properly adjust the AWG's constant voltage level in this exercise. Complete the first Circuit Implementation project. 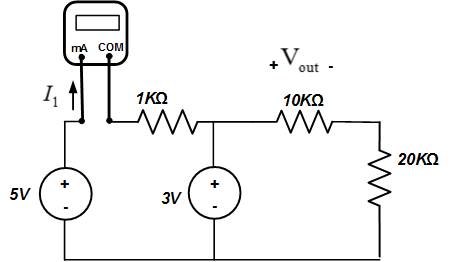 Use V+ to apply 5V across the circuit. Use W1 as the second source to apply 3V across the circuit (we will demonstrate how to set the W1 connector to the proper voltage level further through this project). In order to measure the current I1 , we need to re-configure the circuit to put the ammeter in line with the 1kΩ resistor. The DMM's µA mA terminal and the V+ connector are at node A. The DMM COM terminal and the 1kΩ resistor are at node B. The 1+ connector, the 1kΩ resistor, the 10kΩ resistor, and W1 connector are at node C.
The 1- connector, 20kΩ resistor, and the 10kΩ resistor occupy node D.
The 20kΩ resistor and the Analog Discovery ground are connected at node E.
Your measured voltage should be approximately 1V. Your measured current for I1 should be approximately 2mA. 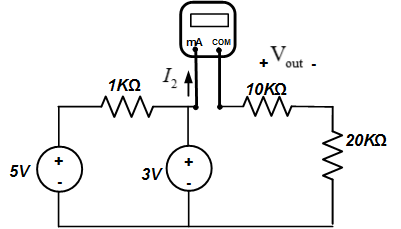 Sometimes it is necessary to measure the amount of current at several different points in a circuit. At times, this process can be a bit frustrating if you do not fully understand how to break apart the circuit in the correct places. We will explore how this process is done by assigning a second current to be measured in the same circuit we just worked with. Proceed through the following steps to find out how this is done. We've added the current I2 to be measured. You should still have the circuit intact from when we measured I1 . We will only be making a few minor adjustments in order to measure I2 . 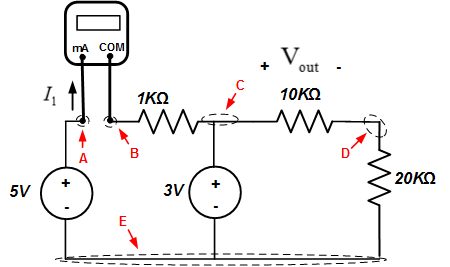 In order to measure the current I2 , we need to re-configure the circuit to put the ammeter in line with the 10kΩ resistor. V+ and the 1kΩ resistor are at node A. The DMM's µA mA terminal, the 1kΩ resistor, and W1 connector are at node B. The DMM COM terminal, the 10kΩ resistor, and the 1+ connector are at node C.
The 20kΩ resistor, the 10kΩ resistor, the 1- connector are at node D.
The 20kΩ resistor and the Analog Discovery's ground are connected at node E.
Go through the process outlined in Step 2: Set up Instruments again, if necessary, to turn on the power supply to the AWG and voltage instrument. Your measured voltage should be the same as before; around 1V. Your measured current for I2 should be approximately 0.1mA.